"Your shorts are too short." "That dress shows your shoulders." Your chest is too prominent." I've talked to girls that have had all these things said to them. Teachers or other people's parents who feel they have the right to dictate what everyone else wears will single out a girl and tell her that she's distracting. It's bullying girls (mostly) and it has to stop. In school, did boys divide teams in gym by "shirts vs. skins?" I'm guessing, unless you went to an all girl school, they did. So, why is that not a dress code violation? It's a rhetorical question, because I have, frankly, heard all the answers. Sometimes even devout feminists try to justify it. Herein lies the problem. 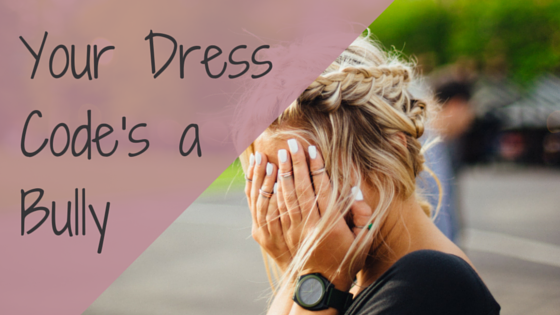 Dress codes aren't about clothes, they are about control. Dress codes typically focus on gender stereotypes (girls wear makeup, boys have short hair, etc.) and a male hetero-norm perspective. It reinforces that girls are expected to act to a different standard than boys, and that boys are incapable of controlling themselves around girls. By creating and following dress codes that have separate standards for boys and girls, it teaches girls that they are mostly perceived as objects, only as valuable as how they look. By giving teachers the responsibility and the right to judge what is being worn, it encourages teachers to look at female students as objects of sexual desire. It gives teachers the right to punish students for reasons other than their behavior or academic achievement and can make for a hostile learning environment. By making dress codes about modesty, it encourages boys to view girls who are less modest as less deserving of respect along with encouraging the notion that boys shouldn't be expected to control their sexual desires around girls they find attractive. In short, it tells them it's okay to sexually assault a girl because of what she's wearing. So, what should we as parents, teachers, aunts, uncles, and adults do about this? To many, the answer is uniforms. And in some cases, uniforms are appropriate. But in the overall state of school systems across the country, there are too many places where the cost of implementing and purchasing uniforms would be an undue burden to parents and schools in low income areas. *shirts to be worn at all times. *no article of clothing can advocate the use of alcohol, drugs, or anything illegal. *shorts, skirts, and dresses must be no shorter than 4 to 6 inches above the knee (exceptions possible for children of above average hight). There are of course other things you could add (nothing sleeveless or no ripped jeans, etc. ), but this is a good, gender neutral start. My school basically had this kind of dress code (except for the shirts- guys took off their shirts in gym and even some of the girls just wore sports bras in gym). No one really worried too much about the dress code and most of us, 97%, went on to college and/or the military (ie. we turned out okay). This doesn't have to be a big issue. It's something we can do together for the betterment of our kids. *It's not a fashion show. *It shouldn't be Project Runway, where people judge you on every aspect of what you're wearing. *It should be a place to grow as an individual and learn how to interact will all types of people.